If you are one of the lucky few like me that still have a cassette deck in your car. You can now put it to better use using this iPhone 4 car cassette adapter to allow your iPhone 4 to pump out your tunes. The iDeck iPhone adapter is compatible with the iPhone 4, 3GS and 3G and promises to provide rich quality sound and while docked your iPhone is charging via a cigarette lighter adapter that is include. Another good feature of the iDeck is the ability to speak to incoming callers using your car speakers. There is also an audio 3.5mm jack to allow you to connect others MP3 players if desired. 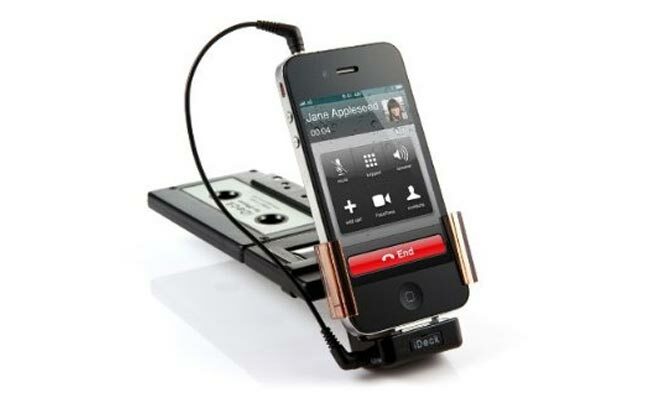 The iDeck iPhone Cassette adapter is available to purchase for $49 from Amazon. Have a look at our article on the difference between the iPhone 4 and iPhone 4S, and also make sure you check out our iPhone 4S review.